The banking industry has been talking about improving the customer experience with customer-centric banking for a long time. From a recent study of French retail banks, neobanks and online banks are winning the customer experience battle. To retain customers, traditional banks will need to improve their overall customer experience, a key priority as reported in DBR Research’s Digital Banking Report 2018. All three of the top trends for 2018 are related to improving the overall customer experience. Failing to address these key trends will hurt laggards. Just because you have a digital presence doesn't mean your work is done, it just means that you need to continue to innovate to attract and retain your customer base. But what makes for a successful banking customer journey? 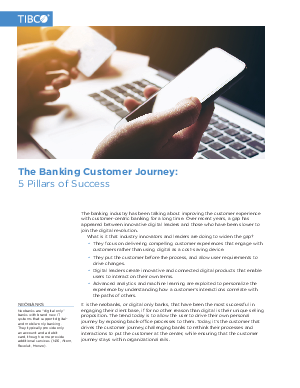 Read this solution brief to learn the five pillars of success for the banking customer journey.